It's really freezing here in Zagreb! I took these photos without my jacket because I love this snake print shirt. A few people commented that I post looks on my blog that I don't actually wear in real life. Well, sorry guys but I don't have such a big wardrobe to fit my real and fake / unreal clothes in. It's true that I'm not always wearing heels, and yes I sometimes do take photos of me without the jacket because I want to show every little detail. I don't see what's wrong about that. what you are doing is FASHION!it's awesome.you don't have to explain anything to anyone dear.i love ur outfit ;) especially the snake print shirt! great outfit. love ur skirt! Love this outfit and you look amazing in it! Don't care about what most possibly jealous people are saying. school for hours while wearing them!? people are jealous...you cannot fix it...it's life..no matter what they say,you look always gorgeous!!...pozz!! Beautiful outfit- I'm the same way! There's no way (as a student) that I'm going to wear heels and dresses to class every day! Absolutely head over heels for this outfit! It even got my LOOKBOOK of the Day award! svidjaju mi se lagani materijali 'ukruceni' teskim asesoarom! I'd rather think of it as dressing fabulously to fit a fabulous life! Life is what you make of it and I think what you wear is great. Your style is incredible! Just love it! Don't hear anyone..You just show fashion, wearing whatever you think is stylish! And you are doing it in a very good way! your skirt is absolutely gorgeous! gorgeous skirt and snakeskin print! Love the snakeskin blouse and the fab clutch. And there's nothing wrong with wearing things on the blog you might not wear that often in real life. Fashion blogs are for showcasing great looks. don't ever care about those words. 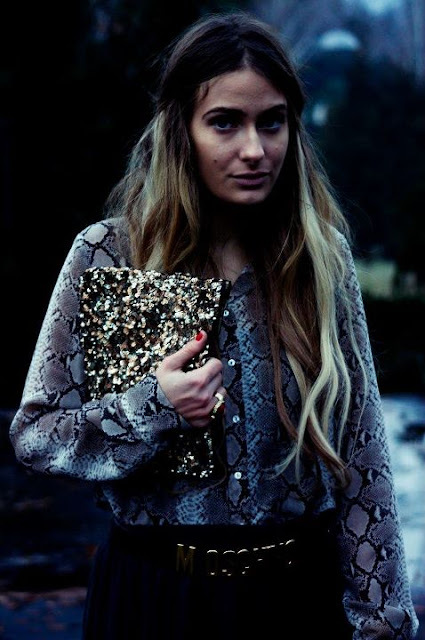 wear what you want to use.. so you looks cool here with the snake print and sequin clutch. me likeyyy! you look absolutely gorgeous! your look is so inspiring! love your style! nice styling, I love it all. The whole combination of your skirt, shirt and bag are beautiful! P.S: don't ever bother about those "haters" !!! Keep bloggin it girl! You look gorgoeus and the photos are just breathtaking! Absolutely gorgeous from head to toe. The shirt, the skirt, the shoes, all of it is great.